Towards the end of 2013 the spectre of ecological catastrophe, which now threatens humanity, again raised its head. Since the start of the 2007/2008 crisis our rulers have managed to largely ignore the questions of global warming and ecological degradation of the planet. This is because other issues dominated the headlines and, in any case, they consider it too costly to deal with (1). However, two recent events have brought the issue back into view. The first was the publication, in September 2013, of the latest report by the UN Intergovernmental Panel on Climate Change, Assessment Report 5 (IPCC AR5). This is the first report since 2007 and shows how much the condition of the planet has deteriorated in the last 6 years, and it is clear that this deterioration is due to the activity of humans. The report marshals a wealth of scientific evidence which shows that, despite all the posturing and hot air produced by our leaders, they have totally failed to reduce emissions of greenhouse gases, and are highly unlikely to limit temperature increase to the 2°C from pre-industrial times, during this century. This is the agreed threshold of temperature increase beyond which the process of global warming spirals out of human control and becomes self-perpetuating. The second event was the November climate conference in Warsaw. This was the 19th such conference since the UN IPCC was set up and like all the others failed to achieve anything concrete. It ended with the usual unctuous words and the commitment to work towards a future conference in Paris in 2015 at which, it is hoped, as always, that some binding limits to carbon emissions could be agreed. Leading green groups such as Friends of the Earth, Greenpeace, various NGOs and others (2) walked out of the conference claiming the developed world was effectively blocking progress towards either cutting emissions or providing help for those most impacted by climate change. There seems little reason to expect anything concrete to emerge from the future Paris conference. While it is clear that capitalism, as an economic system, cannot lay the spectre of ecological collapse to rest, it is also clear that the environmental lobbies, such as Friends of the Earth, think that capitalism can solve these problems. For them it is simply a question, as their conference briefing says, of “making the world wake up to the need for urgent action.” Reversing climate change could, they think, be achieved without any fundamental change to capitalism if only our leaders would wake up. This is a common view amongst environmentalists; a view which sees capitalism moving towards sustainability and zero growth. This view has been considered in detail by an organisation launched by the Stockholm Environmental Institute called the “Global Scenario Group” which baptised it as the “New Sustainability Paradigm.” They attempt to outline the theoretical basis of this scenario in a document entitled “The Great Transition” (3) and claim it is theoretically underpinned by the work of the 19th century economist, J S Mill. He argues that the capitalist economy must reach a stationary state where growth ceases. We argue that such a scenario completely ignores the way capitalism operates, and must operate, as a system and is therefore hopelessly utopian. We’ll come to this but lets start with the scientific findings of the IPCC report AR5. 2. as the material object and instrument of his life activity. Nature is the inorganic body of man; that is to say nature excluding the human body itself. To say that man lives from nature means that nature is his body with which he must remain in a continuous interchange in order not to die (4). The interchange which humanity has with nature has now become so unbalanced that we consume or deplete 25% more of nature’s resources in a year, than the Earth’s ecosystem can replace (5). To make up the shortfall we simply use up the planet’s reserves, a process that can only continue until they are exhausted. If this point is ever reached there will be a catastrophic collapse of civilisation. The capitalist system is like a juggernaut heading for a precipice; but a juggernaut with its own internal system of guidance which cannot be altered. Anthropogenic, or human-made, global warming, is caused by emission of greenhouse gases (GHGs). The most significant of these is carbon dioxide, CO2, which is produced by burning fossil fuels such as coal, oil and gas. GHGs, because of their molecular structure, reflect back to Earth its own long wave radiation emissions. They thereby affect the balance of energy received from the Sun with that emitted from the planet and so obstruct Earth’s cooling system. The temperature of the Earth then rises until a new state of energy balance is reached. The Earth has been in a state of energy imbalance since the late 70s which means it has been receiving more energy than it can emit. This creates a general rise in temperature and puts more energy into the atmosphere. 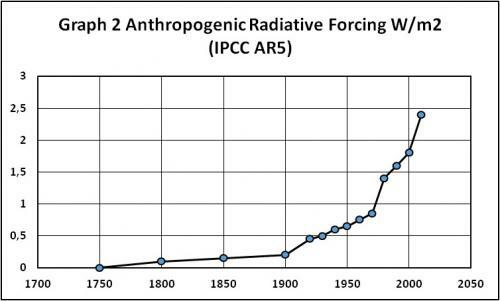 The process whereby GHGs reflect radiation back to Earth is known as “radiative forcing.” The IPCC report AR5 lists the constantly increasing volumes of CO2 in the Earth’s atmosphere and the consequent increases in radiative forcing. Table 1 shows the inexorable rise in the amount of CO2 in the Earth’s atmosphere, and that this is mainly due to burning of fossil fuels, though deforestation and cement production account for about 12% of the total. It also shows that this rise is accelerating. 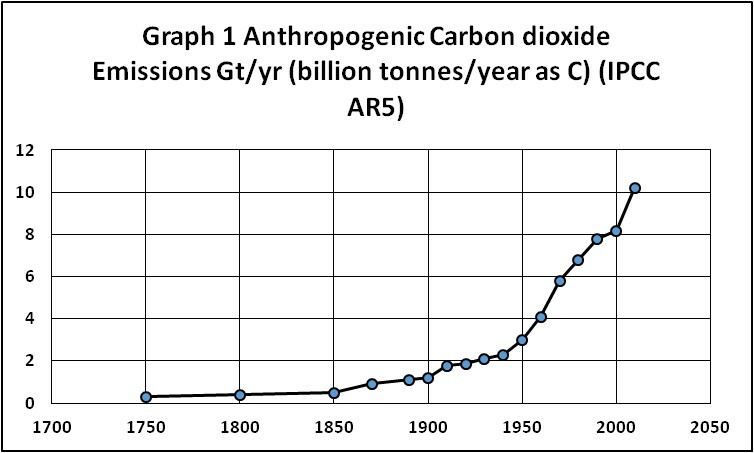 In the last 4 decades the emissions per decade have increased from 69Gt (billion tonnes of carbon) to 92Gt, an increase of 33%. At present annual emissions amount to 10.2Gt/yr, the highest they have ever been. Even if all growth in the global economy were halted at today’s level of emissions, and J S Mill’s fabulous “stationary state” was established, we would still be pumping an extra 5.3Gt of CO2 into the atmosphere every year. The concentration of CO2 in the atmosphere has been in the range of 180 to 290 parts per million (ppm) for the last 2.1 million years, yet it has risen from 278 in the late 18th century to 400ppm at present, a rise of 122ppm or 43% in the last 2.5 centuries. Table 2 shows the increase in anthropogenic radiative forcing between IPCC’s 2007 report AR4 and the 2013 report AR5. In the 6 years between the two reports it has increased by 7.2% and CO2 accounted for 84% of this increase. Overall CO2 accounts for about 65% of all anthropogenic radiative forcing. The global economy is largely dependent on carbon for energy. Today according to the International Energy Agency 86% of the world’s energy is supplied by fossil fuels which, in 2011, received state subsidies amounting to $523bn! (6) The use of fossil fuels is also increasing faster than all other sources of energy combined. In the period 2000 to 2008 global energy use increased by 22% and 86% of that increase was supplied by fossil fuels and half of this was from coal, the dirtiest of all the fossil fuels (7). The correlation between the growth of the economy and the growth in CO2 emissions is fairly close. In the decade to 2007, for which figures are available, the global economy grew, on average, by 2.5%, in terms of GDP, and CO2 emissions grew by 2.8%. 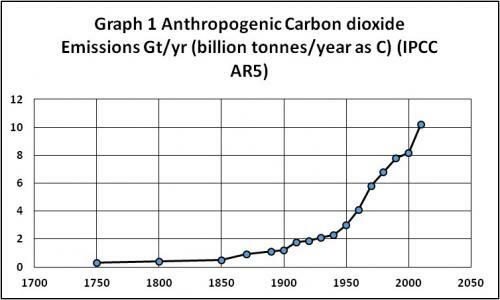 The historical correlation of the increases in atmospheric CO2 and radiative forcing shown in Tables 1 & 2 with the increasing size of the global economy is shown graphically below. These 3 graphs indicate quite clearly how the increase in CO2 in the atmosphere and radiative forcing are tracking the increases in the global economy. Growth in the global economy demands burning of additional fossil fuels which produce CO2. Over the last 3 decades the world oil consumption, for example, has risen from 62.3 million barrels per day (Mbpd) in 1980, to 74.7 Mbpd in 2000, and to 87.3 Mbpd in 2011 (8). Similar rises in extractive industries could be listed. However, a representative example is steel production since steel is used in most industrial commodities. Steel production has risen from 700 million tonnes per year (Mt) in 1980 to 851 Mt in 2000 to 1547 Mt in 2012 (9). There is a clear causal relationship between global capitalism’s search for profitable accumulation and global warming. Even bourgeois commentators are no longer able to deny this, and it is for this reason that environmentalists aim to create a “no growth” capitalist economy. Nature has many thresholds that we discover only when it is too late… For example, when we exceed the sustainable catch of a fishery, the stocks begin to shrink. Once this threshold is crossed, we have a limited time in which to back off and lighten the catch. If we fail to meet this deadline, breeding populations shrink to where the fishery is no longer viable, and it collapses. We know from earlier civilizations that the lead indicators of economic decline were environmental, not economic. The trees went first, then the soil, and finally the civilization itself. To archaeologists, the sequence is all too familiar. Our situation today is far more challenging because in addition to shrinking forests and eroding soils, we must deal with falling water tables, more frequent crop-withering heat waves, collapsing fisheries, expanding deserts, deteriorating rangelands, dying coral reefs, melting glaciers, rising seas, more-powerful storms, disappearing species…. Although these ecologically destructive trends have been evident for some time …. not one has been reversed at the global level. … The world is in what ecologists call an “overshoot-and-collapse” mode. Demand has exceeded the sustainable yield of natural systems at the local level countless times in the past. Now, for the first time, it is doing so at the global level. Forests are shrinking for the world as a whole. Fishery collapses are widespread. Grasslands are deteriorating on every continent. Water tables are falling in many countries. Carbon dioxide (CO2) emissions exceed CO2 fixation everywhere (10). It must be clear to anyone with their eyes open that we face an urgent crisis yet the ruling representatives of capitalism have greeted all the above with indifference. Since the IPCC was set up by the UN all its publications, which were supposed to be providing advice for governments, and all its international meetings have achieved nothing. The only binding treaty on reduction of emissions was the Kyoto protocol, however it was undermined by the refusal of the US to ratify it and weakened by Canada, which withdrew from the treaty to develop its oil sands. The treaty was supposed to reduce emissions from 1990 levels by 5% by 2012, however by then they were approximately 30% above their 1990 levels. The voluntary emission reductions, which have been announced by various nations including the EU and UK, are generally a deception. Reductions can be achieved in developed countries while the level of global emissions increases by simply outsourcing emissions. It is estimated that 33% of the CO2 emissions for consumption goods used in developed countries are now emitted in developing countries (16). Alternatively countries can simply ignore their voluntary commitments as Japan, for example, is doing (17) following the Fukushima disaster, and there is no sanction for this. The capitalist class, of course, appoint their top economists, rather than environmental scientists, to advise them on the ecological crisis. In the UK, for example, the economist Nicholas Sterne produced a report for the government in 2006 advising that CO2 concentration in the atmosphere should be limited to 550ppm, which he advised would be equivalent to a temperature rise of 3°C. He concluded that 1% of global Gross Domestic Product (GDP) needed to be spent annually to achieve this. However, to reduce emissions and temperature rise more than this would be too expensive. Such a temperature rise is, of course, beyond the 2oC threshold which climate scientists estimate would trigger runaway global warming. Sterne has subsequently admitted he was wrong on the temperature rise, and it would be 4°C, a rise which makes runaway global warming even more likely (18). Similarly the US economist W. Nordhaus in a book called “The Climate Casino” has calculated that a 2°C rise in global temperature could be achieved if 1.5% of global GDP is spent on reducing GHG emissions. This cost could only be achieved if all the main polluters agreed and cooperated in limiting emissions. If only half the main polluters agreed the costs would rise to 3.5% of global GDP which would be prohibitively expensive and eliminate global growth. What these economists do not appear to realise is that, while starting from the assumption that the ecological crisis can be solved within the capitalist system, their calculations, which show the required costs would be unsustainable, prove the opposite, namely that this crisis cannot be solved within capitalist relations of production. It is clear that the demands of the capitalist system, namely profits via cheap energy are being followed in preference to any strategy which could ensure the long term survival of life on the planet. Why are we doing exactly the opposite of what rationality should dictate? The fall in profit rates in turn leads to increased competition between capitals. Capitals responds to this by converting part of the surplus value extracted from workers into fresh capital and accumulating it in order either, to introduce further technical improvements, or to increase the scale of production or both. This produces a circuit of continuously expanding reproduction with each circuit of production leading to an increase of capital. Although the rate of profit tends to fall, by increasing the scale of production, and selling more commodities, the mass of profit can be maintained. These tendencies which are felt initially at the level of the individual capitals, tend to generalise themselves over a whole economy and finally operate on a global scale as profit rates tend to average out. This results in capitalism’s desperate struggle for growth. 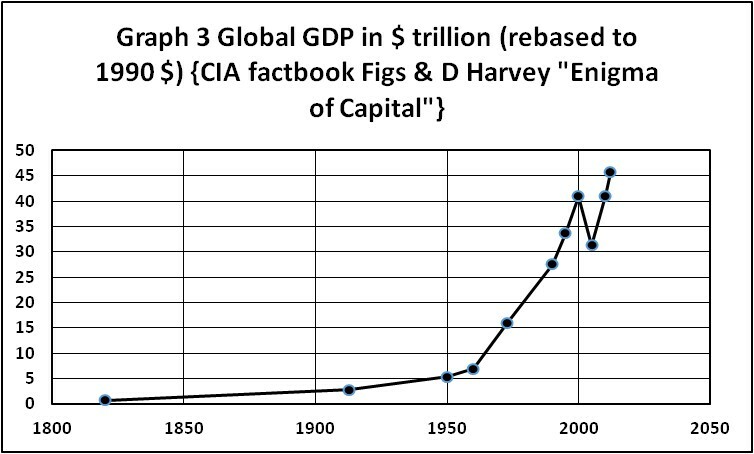 Capitalism has to “expand or die”, which is why all national economies measure their success in terms of growth. At present the global economy, measured by GDP, is growing at approximately 3% annually which means it will double in size every 24 years. This means doubling the CO2 emissions and doubling demands on an ecosystem which is already overloaded by 25%. Only when the ecological problems start to affect profits will capitalists start to treat them seriously. This will occur when the ecological reserves have been used up and by then it will be too late to do anything about it. This brief sketch of the dynamic behind capitalism’s continual drive for growth shows that the forces propelling this drive come from the workings of the capitalist system itself, not from the immorality of the capitalist class. They are material forces, they are not ideological ones. Consequently the attempts of environmentalists to persuade the capitalist class to “wake up” and to adopt a zero growth economy, reflect a failure to understand the internal dynamics of capitalism, and are therefore futile. However, this is exactly what the most serious environmentalists are trying to do. … policy instruments as eco-taxes, social subsidies and green accounting (would be enforced). But these would be manifestations of deep processes that reorient the way the economy functions. The economy becomes a means of serving people and preserving nature... The transition would be expressed in altered behaviours and practices of people, firms, governments and international governance systems. Enlightened businesses would increasingly seize the initiative, showing that eco- efficiency, green marketing and social responsibility offer a competitive advantage. Corporations that pursue new codes of conduct would be rewarded in the market place, while those that do not would be punished by an increasingly informed and vigilant public mobilized by NGOs. A green dividend would flow from the cost-savings of eco-efficient corporations and the maintenance of society’s environmental capital. A peace dividend would stem from gradual reduction of the world’s $700 billion annual military expenditure to a sufficient level for world peace-keeping, perhaps $30 billion (?). A human capital dividend would come from harvesting the creativity and contributions of the billions who would otherwise be consigned to poverty (22). It must always have been seen, more or less distinctly, by political economists, that the increase of wealth is not boundless: that at the end of what they term the progressive state lies the stationary state, that all progress in wealth is but a postponement of this…The richest and most prosperous countries would very soon attain the stationary state…This impossibility of ultimately avoiding the stationary state - this irresistible necessity that the stream of human industry should finally spread itself out into an apparently stagnant sea - must have been, to the political economists of the last two generations, an unpleasing and discouraging prospect (23). Mill welcomes such a stationary state and considered it was close to being achieved in 1848 (24). As he himself notes, other classical economist, such as Adam Smith, David Ricardo regarded the “stationary state” as being incompatible with capitalism, and thought that if it ever occurred it would be the death knell of capitalism. The “New Sustainability Paradigm” also takes up Mill’s idea (25) that the distribution of the social product could be changed, while the relations of production remained unchanged. This would allow more to be distributed to the working class. The laws and conditions of the Production of wealth partake of the character of physical truths. There is nothing optional or arbitrary in them. ... It is not so with the Distribution of wealth. That is a matter of human institution solely. The things once there, mankind, individually or collectively, can do with them as they like. They can place them at the disposal of whomsoever they please, and on whatever terms (26). Mill’s attempt to separate the laws of production from those of distribution, and to distribute the social product more equally was exposed by Marx as impossible under capitalism. The prevailing distribution of the means of consumption is only a consequence of the distribution of the conditions of production themselves; the latter distribution, however, is a feature of the mode of production itself. The capitalist mode of production, for example, rests on the fact that the material conditions of production are in the hands of non-workers in the form of property in capital and land, while the masses are only owners of the personal conditions of production, of labour power. If the elements of production are so distributed, then the present day distribution of the means of consumption results automatically (27). As outlined above capitalism needs to constantly accumulate and operates in a circuit of constantly expanding production. Mill and the “new sustainability paradigm” want it to operate under a regime of simple reproduction where surplus value is not accumulated but is shared out equitably with all members of society. For this to occur private property in the means of production, which, under capitalism, determines distribution of the social product, would have to be ended! Also competition between capitals would have to cease on a global scale. The equal distribution of the social product throughout society undermines the motive of capitalist production which is production for profit. The present world order is driven by the struggle for profit which leads to competition, nationalism and imperialism. These are the characteristics of capitalism. Yet all of these have been eliminated in the utopias described by the “Global Scenario Group” and by Porritt. On the one hand they admit that the present order of states, dominated by an economy exploiting the working class, struggling for profits, operating with relentless competition and backing all this up by imperialism, cannot possibly lead to their utopia, since it specifically excludes these things. On the other hand by excluding these key characteristics of capitalism they admit their utopia is in certain fundamental respects non-capitalist. Porritt is, in this sense, admitting his utopia is not achievable without a break from capitalism. Yet this is something he is not prepared to countenance. He maintains his utopia is a type of capitalism worth fighting for. The whole scenario is shallow reformism, shot through with contradictions and quite unachievable. It is clear we are dealing with half-baked ideas and the attempt to give them theoretical underpinning form J S Mill only exposes their shallowness. Although previous societies have inflicted local environmental damage on the planet which sometimes was so severe that it led to their extinction, as possibly the case of the Easter Islanders, the present scale of degradation is of an entirely different order. It is global and affects everyone. As has been shown above the present destruction of the planet is rooted in the capitalist system of production and cannot be solved without a break with capitalism. We need to create a higher form of social organisation before the present system destroys us all. The entire system of production based on wage labour and capital needs to be replaced with a system which produces for human needs. All the half measures of converting aspects of capitalism to socialism, while the fundamentals of capitalism remain in place, are just wishful thinking; and to pretend they could solve our problems is pure deception. A higher form of society needs to be created, before most of the measures described by Porritt in his “brave new world” could be put into practice. However daunting this prospect is, it remains the only realistic solution to our problems. From each according to their ability, to each according to their needs (29). A society where the free development of each will be the condition for the free development of all. Such a society will differentiate itself from capitalist in a myriad of ways, but the principal differences will be that it is a society without state, without money, where the mass of humanity participate in the planning and running of society. It will be a society without wage labour and commodity production and without classes. For the first time in human history it will be possible to collectively plan the future of the human species. Humanity will have a common interest and will be able to work towards achieving it. Working time will be reduced and the mass of the population will be drawn into the running of that new society. All will have a common interest in solving the ecological problems inherited from capitalism. With the abolition of capitalist society, all its waste, its cruelty, its wars, together with the “misery, agony of toil, ignorance, brutality and mental degradation” it inflicts on the working class, will be ended. Communist society will draw on the abilities of all and produce for the needs of all. It will be able to balance these needs with sustainability. It will then be possible to roll back and repair the dreadful damage capitalism has inflicted on the planet in the few centuries during which it has been the dominant system of production. The choice facing the world on the environmental front, as on the social front, is one of the ruin of civilisation or the construction of a communist world. 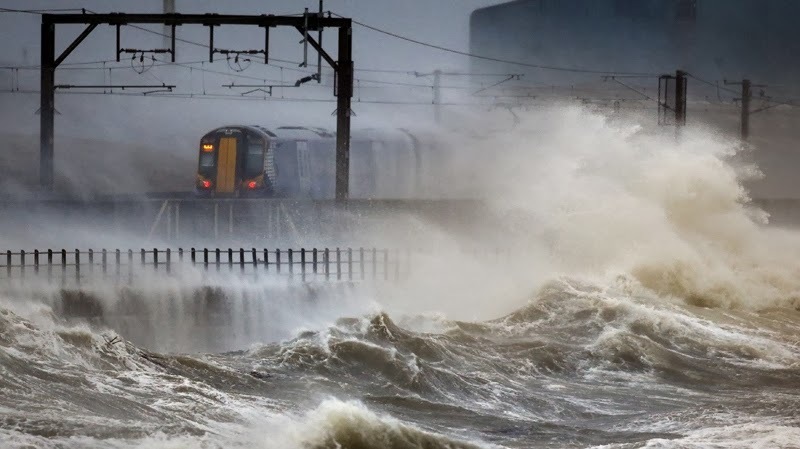 (1) The last climate change conference attended by world leaders was the Copenhagen conference of 2009, which like the previous 14 conferences achieved nothing whatsoever. Since then there have been 4 further conferences, in Cancun, Durban, Doha and the latest in Warsaw (capital city of one of the worst polluters in Europe!) have all been low key with world leaders keeping well away. (2) Some other groups who walked out were WWF, Oxfam, Action Aid, Jubilee South, 350.org. In all 800 people walked out. (12) Apple and pear farmers in Szechuan China are now forced to use paint brushes to pollinate the flowers of their trees. Financial Times 9/11/2013. (15) The UK government has provided tax breaks for fracking and incentives for local authorities to encourage drilling. 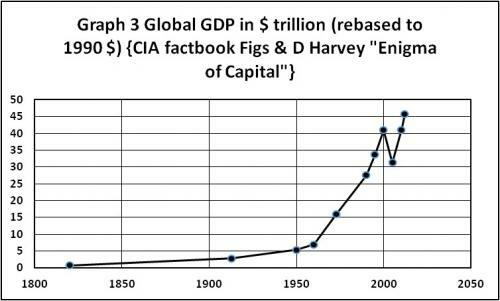 (24) Since 1848, when Mill thought the “Stationary State” was close the global economy has grown by a factor of approximately 30. (25) Mill took this idea from David Ricardo (1772 – 1823). Ricardian socialists argued that workers were entitled to the full value of what they produced. They considered that the distribution of the social product could be carried out independently of the distribution of the means of production. (27) K Marx Critique of the Gotha Programme. (29) Marx Critique of the Gotha Programme. This is the most amazing article I've ever read on climate change and one of the most persuasive I've read ever on the need to remove capitalism before it removes us. It is clear and easy to read. It is truly remarkable. Read it and tremble in your shoes. Send it to your friends and to those who aren't as well! Then let's all get together and act, if it isn't too late already!